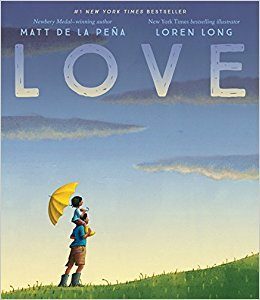 I believe that the book Love written by Matt de La Pena and illustrated by Loren Long offers both windows and mirrors for each page provides an image of where love lives in life’s most beautiful and most difficult moments. It is a book that touches the heart and expands our definition of love. It inspires us to look within our own lives and uncover the love that we may not know is there. It leads us to honor the love present in the lives of others. A boy in a wheelchair offering food to a man who has lost part of his leg. A father and daughter dancing on the top of their mobile home. Children playing with a police officer in the refreshing water spraying from their fire hydrant. A neighbor providing comfort and warmth to a girl as firefighters extinguish the flames that engulf her home. A parent’s comforting touch and offering of security and shelter from the darkness in the world. A boy caring for his younger sibling while their parent leaves at the break of dawn to head to a job that will support them. A boy fishing with his grandfather and playing horseshoe with his uncle. In each situation, we find ourselves and see the lives of others. 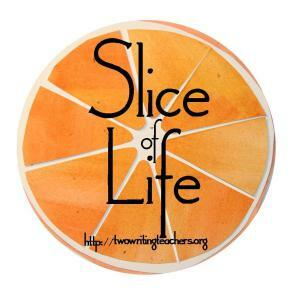 Reading Love inspired me to notice and reflect on the love in my life and the lives of others. I share a few places where I have felt and witnessed acts of love. Listening with my whole heart as a friend expresses her sorrow. Massaging my daughters’ feet with essential oils as she lays in a daze of sickness. Rocking my youngest daughter as she experiences her first heartache. Making the 6-hour round trip to spend the day with my beloved grandfather. Remembering my father when he was agile and mobile, dancing with my younger self in our living room. Pedro arriving late to my class after ensuring that his little sister arrived safely to hers. My mother rubbing her 92-year-old father’s back as he recovers from a recent hospital stay. Thousands of people gathering to share their sorrow with the community of Parkland. The tears of an Iraq war veteran when he took my grandfather’s hand and thanked him for his service during World War II. Where does love live in your life? Where do you witness it in the world? I’ve heard so much about this book. And now reading this slice of yours, I think I’m going to have to get it. That book is a treasure. I bought a copy for myself and each of my children.